The 1967 model had the same body lines as the 1968 model. There were a few design changes in 1968. The vent windows were eliminated. To replace that airflow, below-dash air vents (Astro-Ventilation) were added to the interior. Sidemarker lights were added to the front fenders and ther rear quarters, a mandate for all 1968 vehicles by the NTSA. Engine size emblems were moved to the front of the fenders. The tail lights and the standard (non-RS) grille were restyled. The door mirrors were changed from circular to rectangular in shape. Additional padding was added to the dash, A-pillars, and the armrests. Much of the bright interior trim was changed to a brushed finish to reduce driver glare. The console, if ordered, was a new totally restyled model. A woodgrain (simulated walnut) dash center panel molding was a new finish. 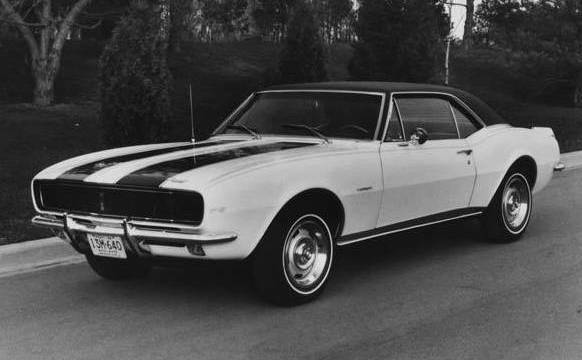 While the 1969 hood, roof, and decklid did not change, the body lines were significantly modified at the nose, fenders, quarters, and tailpan, giving the Camaro a more streamlined look. A molded body streak extended from the rear of each wheel opening, adding to the effect. Tail light bezels were changed to a triple-lens styling. The angle of the standard grille was increased to make it more pointed and the size of the grille openings was increased. The Rally Sport grille was redesigned. A rear quarterpanels side "louver" impression was included in the sheetmetal in front of the rear wheels (this impression was overlayed with chrome trim as part of the style trim (Z21/Z22) option). The dash was redesigned with square gauges versus the round gauges in 67/68. The interior simulated woodgrain pattern was changed from walnut (68) to rosewood (69). The ignition switch moved from the dash to the steering column. Headrests became a standard feature. The Camaro could be ordered in either coupe or convertible models with either the base 230ci L6 or the base 327ci (307ci for the later part of 69) V8 engine. There were several optional engines available, along with a slew of interior, exterior, and drivetrain options. The following summarizes the Rally Sport appearance option and the major performance (L30/LM1, SS, Z28, and COPO) options that were available in 67-69. The Rally Sport (RS) option was an appearance package that included hideaway headlights, backup lights under the rear bumper, and special exterior trim. It was available in combination with any other option, including Z28 or SS (thus referred to as a RS/Z28 or a RS/SS) or L6 engines. 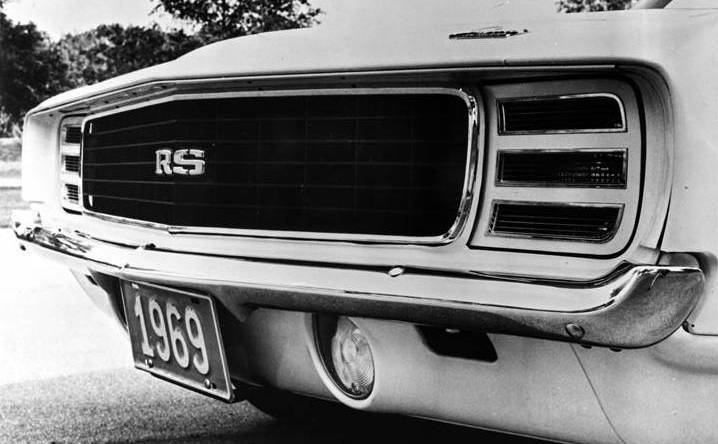 The Super Sport (SS) was a performance option that included upgraded suspension, higher-performance engine, louvered SS hood, and SS striping and badging. The base engine for a 67-69 SS was the 350. 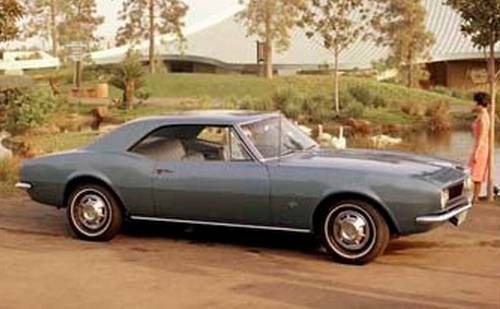 For 67, the 350 engine was a Camaro exclusive and was rated at 295 hp; it was not available in other carlines until 68. The 68 SS350 kept the 295 hp rating but for 69 it was rated at 300 hp. Several 396 engines were optional: the L35/325hp, the 68-69 L34/350hp, and the L78/375hp. The L89 aluminum head option was also available on the L78 in 1968 and 1969. The Z28 option was created to compete with the Mustang in the Trans-Am road-racing series. All first-generation Z28's were coupes with a 302ci/290HP V8 engine (to keep within the 305ci maximum for the Trans-Am series), a 4-speed manual Muncie transmission, and 12-bolt rear axle. The 290 hp engine power rating was conservative, and in racing trim made in excess of 400HP. Front and rear springs were specially matched, and the package included larger 15-inch wheels and rear bumper guards. Power front disc brakes were required but priced separately. Positraction was recommended but not required. Gauges and spoilers were optional with the 67-69 Z28 until April/May 69 when a tachometer became a required option and spoilers became part of the package. 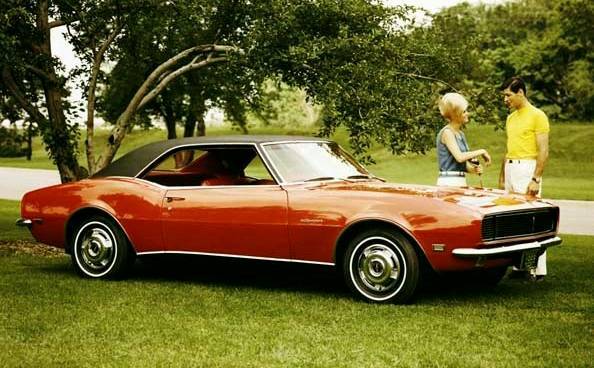 The Z28 was not available with air conditioning, automatic transmission, or in the convertible body style, although one 1968 Z-28 convertible was built via special order for a GM executive. That car still exists today. 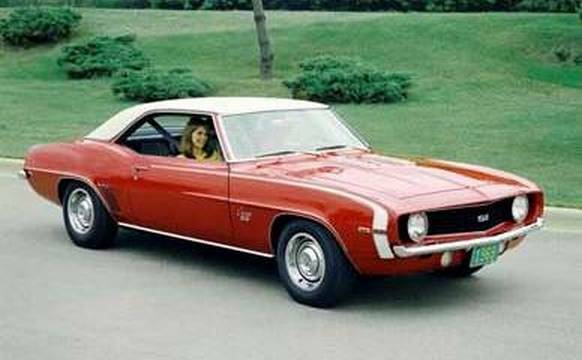 The first year, Z28 had no external badging at all to distinguish it from a base L6-engined car, just the stripes on the hood and decklid. In 1968, a 302 engine emblem was added to the fenders, but in March of 68, the fender engine emblem was replaced with a "Z/28" emblem. 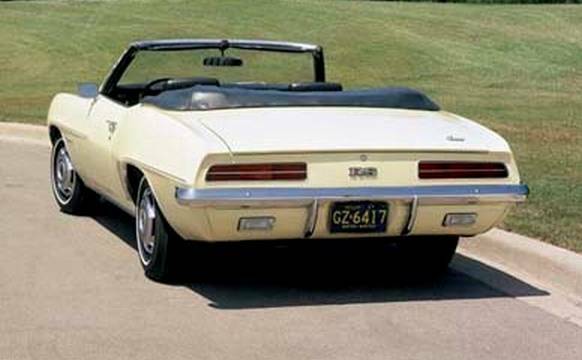 In 1969, there were Z/28 emblems all over the car - grille, fenders, tailpan - and 302 emblems on the optional cowl hood. In 1967 and 1968, a cowl plenum air cleaner and/or headers were available as part of RPO Z28. The cowl plenum air cleaner and the plastic duct were placed in separate boxes in the trunk. If headers were ordered, they were in the trunk as well, along with the trim rings and hub caps for the rally wheels, which made for a pretty full trunk, to say the least! For 69, neither the cowl plenum option nor the header option was available, but in the middle of the model year, the cowl hood became available as did the JL8 four-wheel disc brakes. The 67-68 L30/M20 (327/275hp engine with 4 speed transmission) and the 69 LM1 (350/255hp) were not SS or Z28 models, only optional powertrains over the standard 327 (or 307 in later 69). But both powertrains received upgraded drivetains: 12 bolt axles and (for the LM1 ordered with a 4 speed) Muncie transmissions. Since they have one of the key performance discriminators, the 12 bolt axle, they are often confused as / converted to SS models. The 67-68 L30/M20 was notable for its use of the cast-iron Saginaw 4-speed, whereas the SS350 used the aluminum-cased Muncie 4-speed transmission. Related to this, the Saginaw transmission speedometer cable exited the case on the side opposite the Muncie, and therefore pierced the firewall on the drivers side of the steering column. The Muncie speedometer cable passes through the firewall on the passenger side of the steering column. For more details on the L30/M20, see the L30/M20 Research Report. The 1969 LM1 350 can be more difficult to ascertain, since this model shared many of the same features as the SS350, including two fuel lines, a 12-bolt axle and, if ordered with a 4-speed, a Muncie transmission. The SS350 package included disc brakes and dual exhausts. Lack of either of these features means it originally was a LM1, but, since both were optional on the LM1, the presence of them is inconclusive. For more details on the LM1, see the LM1 Research Report. In both 1967 and 1969, the Camaro was chosen as the Pace Car for the famous Indy 500 car race. In both years, two Camaros were special-built to serve as the actual Pace Car for the race (the second was a back-up). There were a number of other Pace Cars replicas that were used in the festival parade and by VIP and visiting press at the race. Along with the two literal Pace Cars and the other Pace Cars in attendance at the race, Chevy offered Pace Car replicas to dealers for sale to the public. 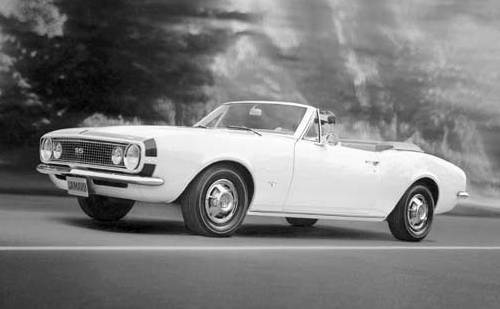 Pace Cars, festival cars, and replicas were always RS/SS convertible Camaros, with either 350ci or 396ci engines. 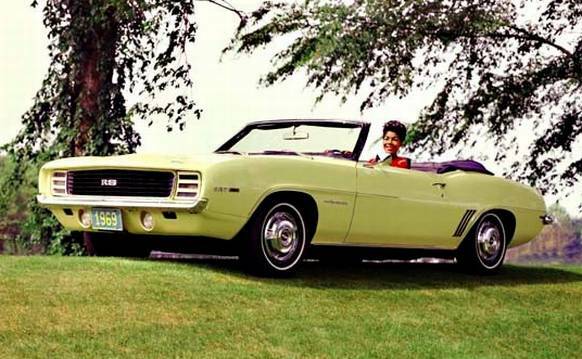 In '67, the color scheme was a white Camaro with blue 'bumble bee' stripe (around the nose), blue deluxe interior, and a white convertible top. The trim tag will indicate either a O-1 or C-1 paint color, a 732-Z interior, and a 4P, 4N, or 4K trim tag code. In '69, the pace car was a white RS/SS with Hugger Orange Z-28-style stripes, cowl-induction hood, special Hugger Orange interior, and a white convertible top. The RPO for the 1969 Pace Car replica was Z11 and on Norwood-built cars, this code is on the cowl tag. Los Angeles-built cars do not have a special code on the cowl tag, but have the unique build combination of 50-A exterior and 720 interior codes. For more details on the 1969 Pace Cars, see the 1969 Pace Car and Z10 Research Report. 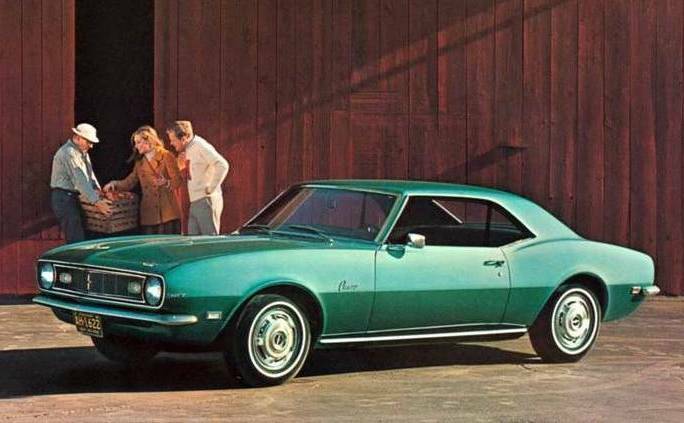 Shortly after the Z11 was produced there was also a special run of '69 Camaros called the Z10, which is believed to be a regional promotional item for certain southwestern states. The Z10 was similarly equipped to '69 Z11 Pace Car replica, but was a hardtop instead of convertible and any color interior could be ordered. There are no production records but the most current estimate is between 450 and 500 of the Z10 cars were built at the Norwood plant between 3rd week of April (04C) and 1st week of May (05A). All known Z10 cars have a Z10 code on the cowl tag. COPO stands for Central Office Production Order. This is the process used by Chevrolet (and other divisions of GM) for internal orders for limited production of non-standard cars. The COPO process was used most often for police vehicles and trucks modified for specific applications and doesn't necessarily indicate a high-performance vehicle. But in 68 and 69, the process was used to order high-performance Camaros that were otherwise not available from the factory. For details on the COPO Camaros, see the COPO 427 Research Report. Two versions of the COPO 427 Camaro were built. 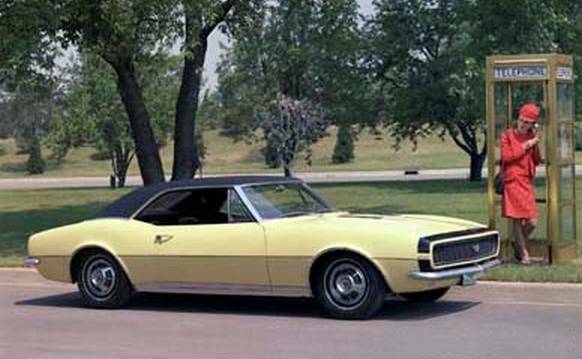 The ZL-1 used an aluminum 427 block and only 69 of these cars were built. The cast iron version of the 427ci/425hp engine (L72) was the other version. Most options were available on either COPO, with the notable exceptions of air conditioning (both were solid lifter engines), JL8 disc brakes (not available with the COPO BE axle), and convertible. COPO 9560 Camaros came from the factory with the ZL-1 aluminum 427ci engine, a HD 4.10 ratio 12-bolt rear-end, HD radiator, cowl induction, special springs, and transistorized ignition. It could be had as either an automatic or a manual. Additional options could be ordered. Originally, the plan was to have 50 cars built and shipped to Fred Gibb Chevrolet (dealer/racer). Other dealers got wind of the order and the total build ended up being 69 cars. The original order of 50 was built identically except for exterior paint and transmission. In the supplemental 19 units, there were two Rally Sport cars and two that also had COPO 9737. Here is a complete list of the options ordered with each of the sixty-nine COPO 9560 vehicles. The COPO 9560 option added $4160 to the price of the car and made them nearly unsellable, with a list price in excess of $7300. Some of the original engines were pulled and a cast-iron big block installed, with the pulled ZL-1's being sold as crate engines for use in racecars. There were ~90 ZL-1 engines produced in '68/'69. 69 of the 90 went into Camaros, 2 went into Corvettes, 2 went into COPO 9567 prototypes, and the rest (~17) were sold as crate engines. There were many more blocks eventually sold as service parts. Despite lower factory quoted numbers, the ZL-1 factory dyno shows it produces ~575hp at ~6400rpm and ~515 ft-lbs torque at ~5000rpm, in stock form with manifolds. COPO 9561 was basically the same as the 9560 except it got an all-iron 427/425hp without transistorized ignition. Many dealers found out about this COPO and ordered it. Records were not kept on these as they were for the ZL-1s, but it is believed that anywhere from 900-1015 iron 427 cars were built at the factory. 1015 is the upper limit as that is the production total for this engine for the year. COPO 9737 was pioneered by Don Yenko in 1968 and is believed to be exclusive to Yenko in 68. The 1968 version of COPO 9737 included a L78 396 (with a unique MV engine code) and the 140 MPH speedo. It was not ordered in combination with any other COPO in 68. The 1969 COPO 9737 required ordering COPO 9560 or 9561 (aluminum or cast-iron 427ci engine), hence creating a so-called "double-COPO". 9737 was labeled "sports car conversion" and it added a 140 MPH speedometer, a 13/16-inch diameter stabilizer shaft (increased from the 11/16-inch diameter standard bar), and E70x15 Goodyear Wide Tread GT tires on 15-inch rally wheels. COPO 9737 cars built after May 1969 also received U16 - factory tachometer with a center gas gauge. In 1969, COPO 9737 was ordered by Yenko and also by other dealers, notably Berger, Jack Douglass, and Emmert Chevrolet. As soon as the dealers realized the price of the COPO 9560 (ZL1), they began complaining. GM realized it would have a problem selling more 9560s, which were no-option race cars with a healthy price tag. The COPO 9567 proposal was dreamed up as a response. Vince Piggins and his GM design staff hand-built 2 of these prototypes. COPO 9567 was not an attempt to build a cheaper ZL-1 car, as the proposed price of this model was well beyond the price of a 9560, at $8581.60 for an M21 4-speed car and $8676.60 for a HD M40 equipped car. The 9567 was intended to be a more streetable car, running 11:1 CR as opposed to 12:1. Both 9567 prototypes were Tuxedo Black Rally Sports with special gold striping. While most of the 9560s were plain-jane cars, the 9567s had options like RS, gauges, spoilers, special steering wheel, racing mirrors, gold-lettered tires, etc. The location of either prototype is not known. Unfortunately for posterity, this COPO never made it to production. All 67-69 performance models, with two exceptions, used the 12-bolt axle. The first exception is the 1967 L30/M20 from model start until approximately Jan/Feb 67, which came standard with a 10-bolt axle. Also 69 SS350's with the Powerglide transmission (an unusual combination) were often equipped with a 10-bolt axle. 12-bolt axles were also installed on any car ordered with the 1969 JL8 4-wheel disc brakes. A car that originally came with a big-block engine, even if the engine is absent, will often still have the original big-block heater box, which is distinctly different from that of the small block or L-6 engine. The big-block heater core inlet and outlet go through the heater box, whereas the small-block cover is unpierced - with the inlet and outlet coming through the firewall next to the inboard end of the cover. All 67-68's with original 350 engines were Super Sports. 302 engines were only installed on Z28s. Original Muncie transmissions were installed only on performance models. TH400 transmissions were only installed in big-block cars. All 1968-69 performance models have multi-leaf rear springs. The Z28 received 4-leaf springs. The 1968 L30/M20 and all models with 350ci or higher displacement engines (including the L65 350ci 2BC engine) typically received 5-leaf springs. Spring applications were weight dependent and it is possible for a L30/M20 or 350 or 396 engined car to have a 4-leaf spring. Most 1968-69 models with the rear brake proportioning valve in the line under the drivers side door, are performance models. However, the usage of the valve was not consistent - it has been observed on some drum brake, 10-bolt axle cars. See the rear brake proportioning valve topic for more specific application information. A car with original factory air conditioning cannot be either a Z28, a L78 SS, or a COPO 427 car (GM did not install A/C with solid-lifter motors). There were many dealers throughout the US that modified the Camaro for more performance. It was an obvious choice - a small, light chassis that could hold any current production Chevrolet engine. 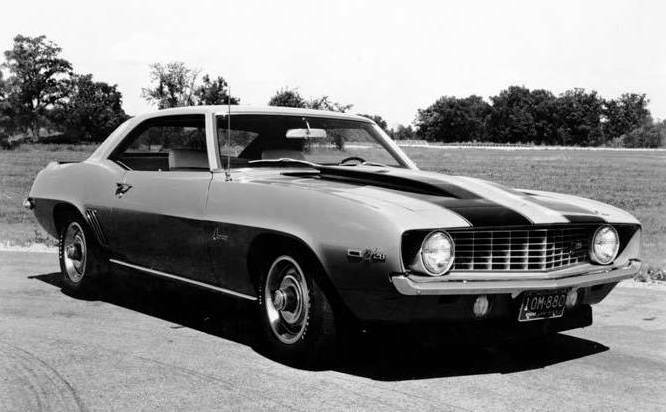 When the Camaro was first introduced in 67, the hottest engine initially was the 295HP 350ci in the Camaro SS. Some of these performance-oriented dealerships started transplanting more powerful 396ci and 427ci big-block motors into these early Camaros for serious street/strip performance. Yenko Chevrolet was notable not only for making these modifications but for marketing and distributing them through a network of other dealers. 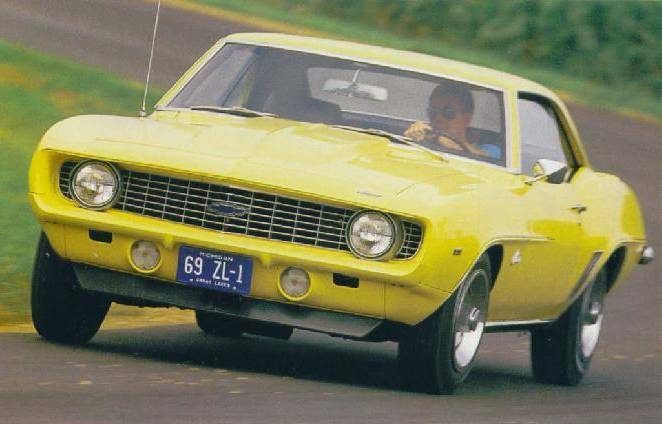 Don Yenko also worked with Chevrolet to use the COPO system to have modifications done in the factory to reduce the labor required by the dealer to modify the cars; most notably having the L72 427ci engines installed thru the COPO system in 69. Yenko production quantities of the "Super Yenko Camaros" are believed to be 54 in 1967, 64 in 1968, and 198 in 1969. In addition to Yenko, a number of other Chevrolet dealerships, including Dana Chevrolet, Nickey Chevrolet, Scuncio Chevrolet, Berger Chevrolet, and Baldwin Chevrolet (Baldwin-Motion) were doing similar engine transplants into 1967-69 Camaros and most of them also took advantage of COPO 9561 427 when it became available in '69. Several of these dealerships added other performance equipment like headers, high performance clutches with scattershields, suspension modifications, and appearance packages. These dealers were literally offering complete turnkey race-prepped cars for sale to the public through their dealerships.